Go forth and write dear marketer, as more content provideth thou with wider reach. And if you holdeth a wider reach than your competitors, you can punch them more easily. This infographic makes me want to play Operation. Remember that game from the 70s that buzzed whenever you killed your patient? Not that removing all the vital organs wouldn’t have done the same thing anyway. Kinda sadistic for a kids game. Do you want to learn (yawn) some marketing goodness, or hear me ramble on about games? I’d choose games personally, but I guess that’s not why you’re here. So on with the marketing we must go. Just don’t be surprised if I say bzzzzzz once in a while to keep you awake. Let’s look at the body and see which organs we can extract from the infographic without killing the poor bugger in the process. Here we have two organs, the brain and the mouth. Imagine having your mouth pulled off! Gnarly. Your Mouth: Luckily it’s not your mouth that’s going to get bzzzzz’ed. We’re talking about ‘Word of Mouth’, that magical inbound elixir that pours customers down your throat when people think you or your content is awesome. They talk about you in the press, mention you in blog posts, and tell their friends. In fact, it’s the primary factor behind 50% of buying decisions. So pay attention to your brain and get people mouthing off about you. This is what you get for producing low grade content. Your Arms: You couldn’t rip the patients arms off in Operation when I was a kid, so they must be invaluable at extending your reach. Breaking news reveals that blogs give sites 434% more indexed pages (huh, what if you only post once a year?). But hey, the arms don’t come off, so who am I to question it. As a bonus, you also get 97% more indexed links. I’m guessing this is based on blogging a lot. We generate new blog content every work day, so maybe we’re eeking close to that mark. Your Heart: How healthy is your heart? My bet is that the more content love you pump through your veins, the more love you get back. One caveat: It needs to be authentic, quality blood, or your visitors will turn you into a modern day Carrie with a bucket full of fake blood. Bzzzzzz. Keep it real folks. Your Legs: Content marketing does the legwork for you. Once you’ve created the story, it’s over to social media to spread the word. A whopping 61% of companies find customers via LinkedIn (typically B2B), 67% via Facebook (most often B2C) and 53% via Twitter (a mix of B2B and B2C depending on your audience and content). 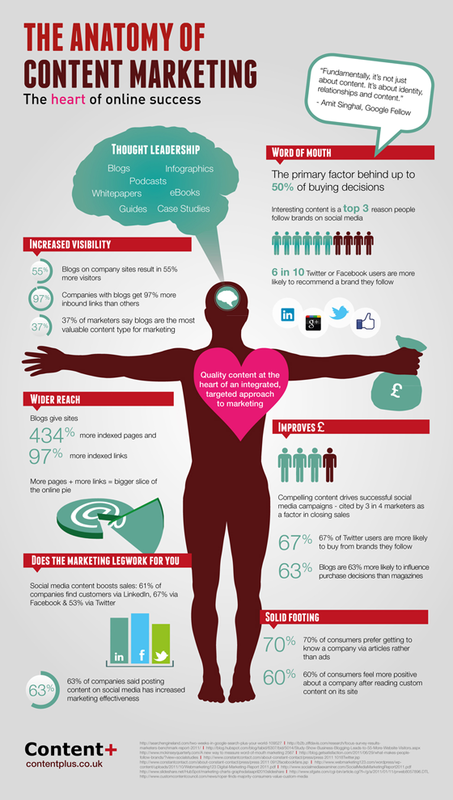 Using social media can really expand the reach of your content. Kinda like your arms. Can you touch your toes? Your Feet: Fear not, the metaphorical torture is almost over. We’re at the bottom of the body, about to smash off your feet like Kathy Bates. I mean, start your content marketing off on a solid footing. Why? Well, 70% of consumers prefer getting to know a company via articles rather than ads (back to the brain – can you touch your toes with your forehead?) Makes sense, ads have felt spammy for decades.